Welcome to the world famous, Coffee Cup Café, home of the “Best Breakfast In Town!” This year the Coffee Cup celebrates our 30th year of serving the Tri- Lakes Community and are grateful for the many years of support that this amazing community has provided. In 1987, Coffee Cup founder, John Dominowski created the Cup philosophy of providing our BEST BREAKFAST IN TOWN! guests with the best home-cooked breakfast in town. 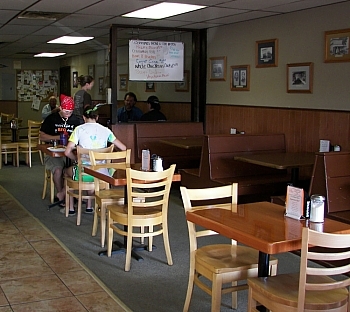 Throughout the years the restaurant has seen many changes. In 2008 the Coffee Cup took on a new endeavor by nearly doubling its size. 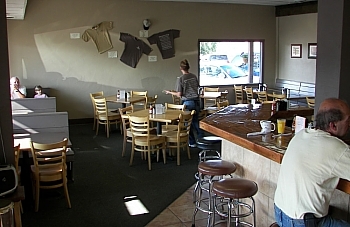 A year after the addition, the Coffee Cup kitchen caught fi re, but thanks to the quick response by the Tri-Lakes Fire Department, the building was saved although the inside of the restaurant had to be completely rebuilt. Through every challenge and success over the past thirty years, our community has been right there behind us with continual support. We consider ourselves blessed to be able to continue to serve the wonderful people in our area, and look forward to the many more years to come. We thank you for shopping local and allowing us the opportunity to serve you today. We´re famous for our homemade green chili and country style potatoes, and our milkshakes aren´t half bad either! You won´t find better food for a better bargain anywhere. We dare you to finish the Manly Marine Meal with pancakes - it´s a feat! In May of 2015, long time coff ee cup employee Benjamin Hibbard, became the new owner of The Coffee Cup Café. The cup was where Ben received his first job and is also where he first developed his passion for the Restaurant Industry. He was just 14 years old when he started bussing tables at the restaurant, but even then he knew he was part of something very special. The Coffee Cup provided Ben with employment throughout his youth and now into his young adulthood. After graduating from Lewis Palmer High School in 2003 Ben moved to Ft. Collins CO for college, but always managed to make it home on every break and summer to serve at the cup. In 2005 Ben relocated to Southern California to pursue a career in Music. After spending 5 years in California, Ben was eager to come back home to the Colorado way of life and the wonderful community that he has always cherished. In January 2014 Ben returned to the Coffee Cup for his final time. He quickly found himself comfortable back at home and worked hard to become the Cups General Manager. From there he was able to focus his eff orts on becoming the next owner of The Coffee Cup Café. In May of 2015 Ben was able to accomplish that dream and purchased the restaurant from Jeremy Diggins. Ben, Eden and their three young boys are looking forward to remaining engaged members of the Tri-Lakes Community and carrying on the local flare of the Cup! 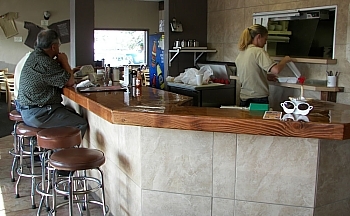 The Coffee Cup Café has a long history in the Tri-Lakes community. Although it was established in 1978, it became the Coff ee Cup Café as it is known today in May 1987 when it was bought by Army veteran John Dominowski from Jane Ojennes. Armed with a long history in the restaurant industry, John took the reins and built the Coffee Cup into a Monument staple by getting involved with the growing community. He was one of the founding members of the Historic Monument Merchants Association, as well as giving his time for countless community fundraisers, the results of which you can still see today. Examples include helping with the fundraising and construction of the “Monument Arch” over Third Street as well as helping with the construction of the fi rst sidewalk down Third Street. Not long after buying the Coffee Cup John hired twin sisters Katherine and Kristen Diggins as high school wait staff , and when they left for college he hired their younger brother Jeremy Diggins in 1991. Jeremy was 13 at the time and John mentored him to be a short order cook in the old school restaurant way of life. In early 1995 Jeremy joined the US Marine Corps at age 17 where he served for four years working on support equipment and AV8-B Harriers. After leaving the Marine Corps, Jeremy returned to Monument and eventually worked for John again, but this time as his General Manager. In July of 2000 Jeremy was able to purchase the Coffee Cup from John. There were some bumps getting started - at the age of 22 and owning his own restaurant Jeremy had a lot learn about responsibility and running a small business. Over the years he strived to remain active in the community, sponsoring events like the Tri-Lakes Cruisers annual car show and the Palmer Lake Volunteer Fire Department Easter pancake breakfast. Jeremy has also served the community as a board member for the Woodmoor Monument Fire Protection District and the Monument Sanitation Department. Over the years many high school students have made the “Cup” their fi rst job. Those students have grown up to be doctors, lawyers, engineers, Soldiers, Marines, Air Force Offi cers, musicians, small business owners, and even a Harvard grad. Five of the former managers, including Ben and Jeremy, have even gone on to own restaurants of their own.